Thanks primarily to the nearby Basin Harbor Club, we frequently have the opportunity to work in and around the quaint city of Vergennes, Vermont. The Basin Harbor Club has been the main attraction drawing people to Vergennes for decades, while the downtown portion of the city has become a great stopping point for history buffs and foodies alike. Vergennes is today a tiny city of fewer than 3,000 people but was once one of Vermont’s most bustling industrial centers. In terms of population, Vergennes is actually the smallest of Vermont’s nine cities and holds the claim to fame of being the first chartered city in the state. The city’s location enabled its prosperous run in the late nineteenth century, as it was close to both the transportation hub of Lake Champlain and the ore mining town of Monkton. Before rail travel became prevalent, waterways were the primary travel arteries throughout the region. This fact, combined with iron being mined right around the corner, led to Vergennes being the building place for the American fleet that battled the British in the area during the War of 1812. In addition to ships, the iron ore was molded into nearly all of the cannon shot the used in the north by the US Army at that time. Vergennes attempted to keep pace during the rise of the railroads, but a small track leading into town traversed a grade that was deemed too steep to be functional. As a result, the town’s industries slowly died off and the population plummeted. Today Vergennes is experiencing a bit of revitalization, especially along main street and near Vergennes City Park. We have found that 3 Squares Cafe, a local favorite, has always been a consistent place to stop by for a quick and delicious lunch. For dinner, Black Sheep Bistro serves wine and our type of food while Antidote is more cocktail driven with a pub style menu. We also appreciate that the local French bakery has gone with the name “Vergennes Laundry.” It may not scream, or even carelessly whisper Thomas Keller, but we appreciate anything that reminds us of Yountville’s culinary Mecca, even if only in name. We recognize that Vergennes is a great place to live, but is usually just a stopping point going to or coming from the nearby Basin Harbor Club. The road between the two locations is full of fields, tall trees, and the occasion line of arbors like the one pictured here. Having wide open spaces to play with allows us to utilize our long zoom lenses and create distinct looks featuring compression. We also like open fields during partly cloud days, as light and shadows can move across the terrain and give us the opportunity to shoot exposing for the light or dark areas, simultaneously giving an image depth. 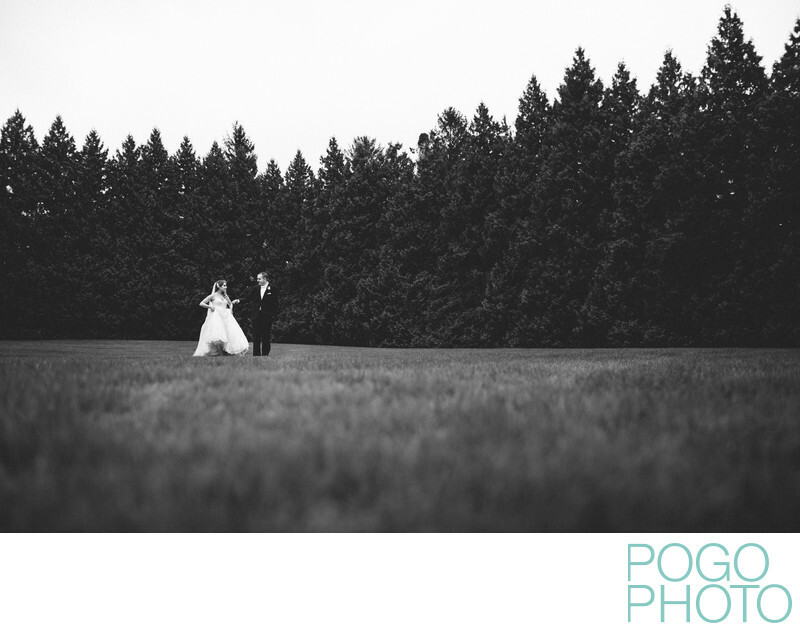 When a day has relatively even light like the one in this picture, we can put the bride and groom against a line of trees or any similar dark background to create contrast. Converting the image to black and white increases this further, making the image more about line than the shades of green present in the trees and grass. 1/400; f/2.0; ISO 100; 35.0 mm.